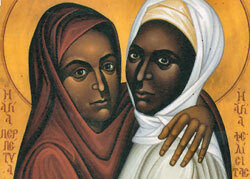 Today is the feast of St. Perpetua and St. Felicity. These two women were martyred in the early 3rd century for entering the catechumenate and being baptized. Perpetua (a noblewoman) was a nursing mother and Felicity (a slave) was 8 months pregnant and eventually gave birth a day or two before she was martyred. There are many things I could talk about on this feast day including the image of female empowerment through adhering to faith in the early church, the idea that this act of martyrdom shows the consequences of the Christian commitment in light of Galatians 3:28 (as Perpetua was free and Felicity was a slave). However, as this is my first Lenten season to walk with the Elect toward baptism at the Easter vigil, I am going to talk about RCIA as apprenticeship into the Christian way of life with regard to martyrdom. I should first say that this idea of RCIA as Christian apprenticeship is not my idea. I heard it at an excellent conference by Dr. Jerry Galipeau, sponsored by the Archdiocese of Seattle. This idea of RCIA as apprenticeship made a great deal of sense to me. By apprenticeship I mean the following; in the catechumenate we are teaching those interested in joining the church the craft of living a Christian life. What is the craft of living the Christian life? St. Perpetua and St. Felicity teach us that the craft of Christian life is the willingness to die for your adherence to your faith. St. Perpetua and St. Felicity provide a different model of Christian living then any of those previously described. Their model of Christian living is a model of Christian fortitude in the face of death. In their adherence to their faith and refusal to recant their baptism they show us a model of Christian faith that is a model of martyrdom. St. Perpetua and St. Felicity teach us how uphold our faith even in the face of death and even facing death as new mothers. I think the point of St. Perpetua and St. Felicity’s martyrdom narrative is that nothing of this world (including a commitment to newborn children) is more important then steadfast adherence to faith. In these narratives it is clear that these women loved their children but it is their commitment to their faith that is (in Tillich’s language) their ultimate concern. They were willing to die knowing that their newborn children would be motherless rather then recant their faith. What does this teach us about how to live our faith? Or in other words, to what are the catechumenate being apprenticed? The catechumenate are being apprenticed to Christian self-sacrifice before money, family, security, physical beauty, motherhood etc. The life of the Christian is a life that no longer belongs to us. To be an apprentice of the Christian way of life is to learn the craft of dying of the self. That dying might include martyrdom but most of the time that dying includes sacrificing our needs for the needs of the other. Those who go through the RCIA process learn about several things but one of the things we should be teaching in the apprenticeship process is Christian death of the self in service of the other. St. Perpetua and St. Felicity teach us that we are to remain steadfast in our faith through our actions even if the consequence of our actions is death. When we teach Christian apprenticeship, this is the craft of Christian living that we are teaching. But there is another key element to this story. St. Perpetua and St. Felicity were martyred together. In other words when we teach this way of Christian living (or Christian dying) we must always emphasize that Christian life happens in relationship with one another; we don’t do it alone, we do it as a group, formed as a group. Nice reflection Katie. I’m going through RCIA right now, but it’s a little strange for me because I come from an Evangelical Protestant background, I’m baptized, I studied theology at BC STM, and I attend Protestant and Catholic church at the same time. So, I feel less like an apprentice, most of the time, and more like a teacher. I tend to know more about Catholicism than most Catholics. Even so, I sometimes feel like I am an apprentice of the catechumens in learning what it means (again) to be Christian, reveling in the newness that I have long long forgotten (or that I never even knew being raised a Christian, and not straying too far from the path). I am continually stunned and amazed with their desire to learn and to be Christians. I appreciate your emphasis on community and how we do this Christian thing together, it’s definitely true. I am an apprentice to my fellow Catechumens, Candidates, and Catholics, and I am a teacher to my fellow Catechumens, Candidates, and Catholics. How might you explain RCIA to someone who is transitioning into the Catholic church from another Christian community, already baptized, or even an adult Catholic who was just never confirmed? Do you think that the apprenticeship model needs to be modified or better explained in these situations? Paige I’m so sorry it’s taken me a few days to get back to your thoughtful comment. I really like the emphasis in your comment on the circle of learning…we are always teaching and learning from each other. The conference I mentioned where I heard this image used actually referenced the situation of a Presbyterian minister and his wife going through candidacy in RCIA and how to meet their needs when they are very clearly catechized. I think that this looks different in each circumstance and that each case should be individually tailored to suit the needs of the individual. (clearly you are catechized, probably better then some of the people working in the RCIA program so you are a really good example.) I’m curious though because I think it’s different in each archdiocese. If you were to walk into my parish with your background I would do a nuts and bolts class on first communion, reconciliation and confirmation. Then you would be fully initiated into the church at the next possible time (likely within a few weeks). Is this different where you are? Are you having to complete the entire liturgical year? Whatever the situation I think the other candidates are lucky to have someone like you in their midst!